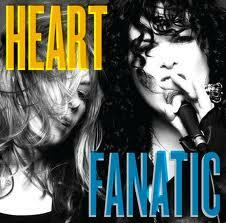 There is a lot going on with Heart these days, their latest album Fanatic was released this week, a biography of their lives also just came out in a spectacular book, all fans must have. 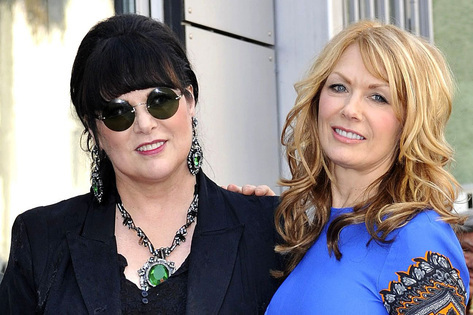 The audio book; Kicking & Screaming: A Story of Heart Soul & Rock & Roll, is even more special since it is narrated by Ann & Nancy themselves, as well as former band members & important figures in their lives as well. They just recently got a star on Hollywood Boulevard & for what its worth, were elected to the so called Rock & Roll Hall of Fame. This week began another leg of their 2012 Tour, landing in the New York area for four shows this week with the first stop in Manhattan at the Beacon Theater. 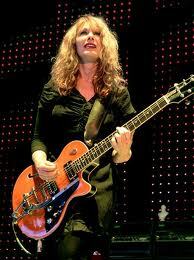 Nancy Wilson is looking as beautiful as she ever has. I have been a fan of hers since the 1970's, as she & Stevie Nicks were my female rock goddesses. I will never forget seeing Heart at Radio City Music Hall in 1985, as she walked up the ledge on the side of the concert hall playing her guitar. I was lucky enough to meet her backstage at the Bottom Line during her acoustic show in the late 1990's, thanks to DJ Darren Devivo. Putting aside her beauty that I admire, she is one hell of a guitarist in which I have share another love for her musical abilities. On stage as well as on record, Her guitar work always so underrated is fantastic. She is in the fore front, carrying all the songs with the band following behind her, a true band leader if you will. Her vocals are as sweet & soft as ever, incredible melodies that lay behind Ann's strong voice. He lead vocals on These Dreams as soft as ever & lead on the new song Walking Good is almost destined to be a Heart classic. 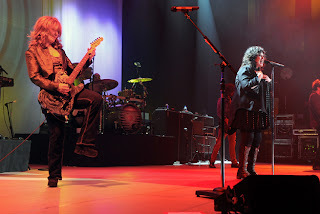 Ann Wilson has the most powerful female singing voice in rock & roll. Possibly the most powerful female vocalist since Janis Joplin. The only other female rock singer as great is Stevie Nicks but it's a completely different style of singing. Ann sings the old classics with the same power she had as a young singer, now maybe even better since she's a better singer than when she started. She makes the transitions to the eighties ballads like What About Love & slower tunes with the same kind of power. There as a melodic yet still powerful flow to songs like Dog & Butterfly & of course Alone. Alone has become a Heart mega live classic, mainly due to the incredible vocals Ann Wilson belts out. Its a moment where you just stop, and watch how talented an artist is, almost bringing tears to your eyes, as crazy as that sounds. As I have been a Heart fan since the beginning, it was Ann's voice (as well as Stevie Nicks) that warmed me with female vocals in the rock world, usually dominated by men in those days. If there were any complaints with the show, it was too short. I timed it around am a hour & forty minutes. Since they are promoting a new album, they played a lot of new songs; five to be exact. The new songs are good; they are hard, bluesy rock & roll. It's a great album, in my opinion much better than the two previous releases (Jupiter's Darling & Red Velvet Car). Some of the more lighter tunes remind me of the Heartmongers projst they did in the late nineties, which I thought was fantastic. The songs are good live & are a great promotion for the new album. I was prepared, an immediate download & devouring myself in the new album since Tuesdays release. 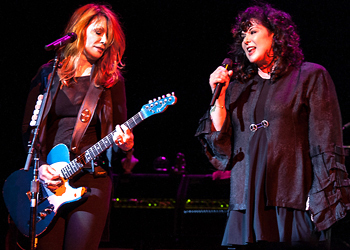 After seeing Heart so many times, it's also nice to see the versatility of the new songs. But although not realistic, another hour of classics would have been great. But I guess you have to satisfy with keeping them wanting more!!!! A special mention for the other band members, who certainly get unnoticed in the background of The Wilson Sisters. With the band since 2004 are Craig Bartock on lead guitar & Debbie Shair on keyboards & backing vocals. Ben Smith has been on drums since 1998 with the exception of 1999-2001. The new bass player is Dan Rothchild. As a band these folks were tight & a perfect support for the Wilsons. It was a great show, Heart never disappoints, definitely one of my favorites & certainly one of the most underrated bands of all time. Ann & Nancy rock! Loved the concert. Why didn't they introduce the band members?